Git is a Version Control System (VCS) for source code created by Linus Torvald (the creator of Linux). It allows to share and collaborate on code efficiently. It somewhat has a high barrier to entry especially because it's packed with feature. However you can learn a few basic terms and commands to use it in an easy way. In opposition ot other VCS (Subversion for instance), Git is distributed. It means there's no central server and everything you do is happening on your local machine. It also means you can work on your code locally without being connected to the internet and syncronize with a remote repository later. Here's a list of usual terms you will enconter in the guide, you can refer to it later. Commit This is a set of patches bundled together with an author name and email at a specific date. 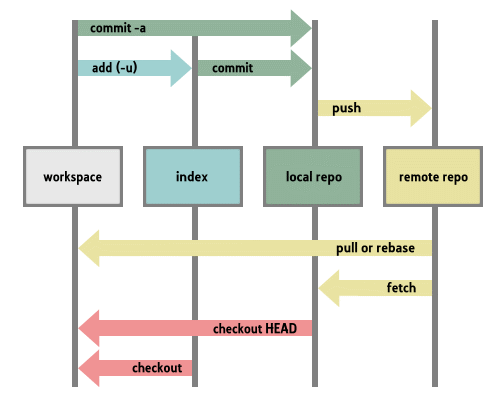 The history is composed of a sequence of commits. Each commit has a parent commit forming a immutable history. Let's break down every command. You've made some changes to some file in your repository and now you are ready to settle those in a commit. git commit -m "Adding the new feature 1"
git commit -m "Fixing a nasty bug in main.c"
The result will be two separate commits, each one contains the corresponding patch. Those commands let you interact with the remote repository (c4science). You can either pull the new commits from the remote or push your new commits to the server. It's always a good idea to pull first because Git will not let you push if there are new commits on the server that you don't have on your local copy. You are then in charge of integrating those new commits by merging, and potentially fixing some conflicts. Conflicts can happen if the remote and local commits modify the same portion of code, a human then have to review both changes and fix them manually. If the changes are in distant portion of code, Git can automatically merge the changes without conflict. Git has a lot of usefull commands. One of the most important is git status. It will always tell you what to do. Git tells you that there are unstaged changes, that you can add them to the staging using git add or the shortcut command git commit -a.
Git tells you you have an untracked file, Simply run git add feature-2.cto add the file to the staging area. Simply edit the file, and manually choose which side to keep, and if needed keep some part of the other file, for instance here's my resolution to the conflct, and the commands to fix it. git commit -m "Fix conflict in main.c manually"